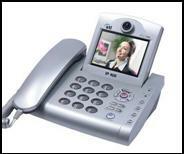 With Video Phones, you not only have the option to speak to the person you are on the phone with, but if both parties have a Video Phone, you can also see each other. This option is great if you have offices in different locations throughout a state or the country. Instead of spending thousands on travel fare, videophones are the cheaper solution to nationwide meetings.